It is very much ‘that’ time of the year now in England when there is no denying that Autumn is well and truly here. It’s cold, I want the heating on and most of my fabric shopping now is now cosy corduroys, soft jerseys and snuggly sweatshirting. My Tilly and the Buttons Cleo pattern is also something that I reach for in the Autumn/Winter. 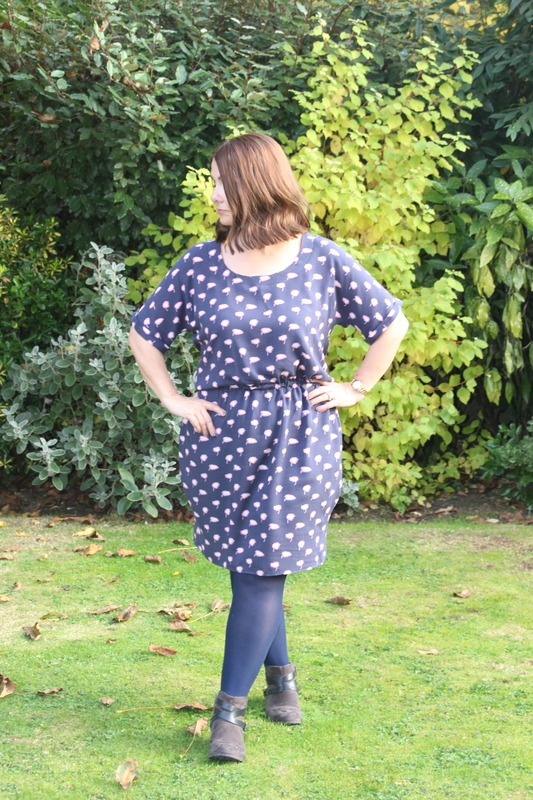 Whilst I have seen many Summer appropriate versions of this – for me it is all about snuggly thicker fabrics teamed with long sleeved jersey tops. My fabric choice for this Cleo is this stunning navy spotty corduroy. It was very kindly sent to me by My Fabrics, and I couldn’t be more pleased with it. 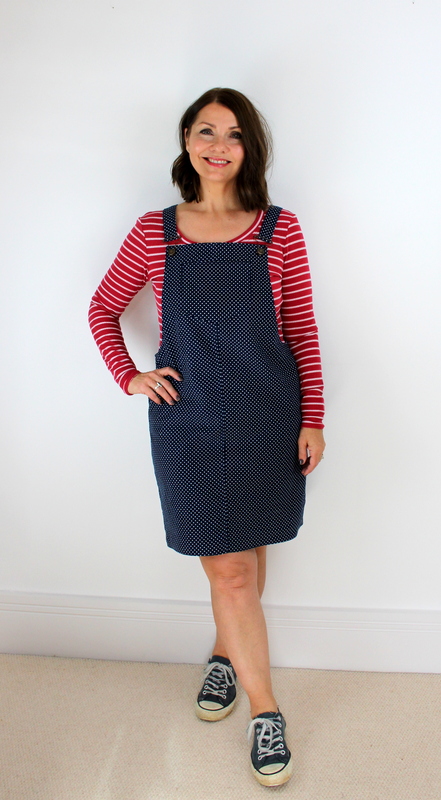 There are so many colour choices with this spotty corduroy, but as I kind of knew that I probably wanted to pair it with my red striped Tilly and the Buttons Agnes Top, I went ahead and opted for the navy blue. Along with the huge choice of spotty cords, there are several other patterned designs and a wide range of the thickness of cord – from jumbo down to baby cord. I would describe it as a light weight corduroy, beautifully soft, but certainly with enough structure to make the perfect Cleo. I added a pocket on the bib front, but chose not to place the optional pockets on the back of the dress as I didn’t want any attention drawn to that area!! This is the first time that I have used dungaree clips as a fastening for a Cleo. I always opt for a button option, but I have had these clips in my sewing basket for a while now and thought that I would give them a go this time. They are really easy and straightforward to use, really nothing to them at all – you will need a hammer however. Fortunately my husband was able to provide me with that! To attach the clips, carefully mark out exactly where you want to place them. Pierce a small hole using an awl or other sharp point. Place the pointed part of the rivet through the hole from the back, and line up the button over the top. Make sure if your button has a design on it, that it is the right way up, as it is impossible to twist it once in place. Ta Da! That’s all there is to it, such fun and the good news is that you get to do it all over again on the other side! I hope you like the outcome as much as I do. I really like the pairing of spots and stripes together, also love the red and blue combo too! Thank you very much to My Fabrics for providing the fabric for this post. This is something I am going to love wearing this season. I certainly have my eye on some of the other patterned cords at My Fabrics and you may well be seeing more of this again soon! This is a special dress. It is the only dress that I have ever made more than one of, and I don’t plan on stopping yet – there are many more ‘Bettine’s’ still to come, that’s for sure. 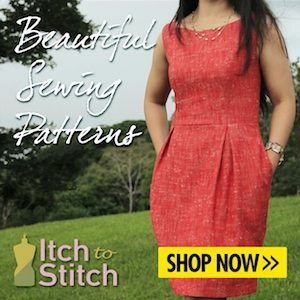 It’s very easy – no tricky fastenings like zips or buttons. No darts or setting in sleeves. It’s quick to make up – I love seeing it coming together so quickly. It’s comfortable – who doesn’t love an elasticated waist? Pockets. Yes please. Enough said. I chose to make it in a navy patterned viscose. It has a lovely drape and a little stretch (not necessary for this dress though), and although I love the fabric it is quite lightweight and sheer. Upon reflection it may have been wise to have lined it. Still great though and very wearable. I also chose to make the version without pockets. I must have taken leave of my senses- my first Bettine was made with pockets and I love it. Note to self – all future Bettine’s to have pockets. I also decided to make the sleeves without the tabs and keep them plain, I prefer the sleeves like this. It’s a dream to make. Excellent instructions are written so well and accompanied by great pictures take you through the whole process, and if you need extra help then head on over to www.tillyandthebuttons.com where there is lots more help and inspiration with suggestions on fabric choices, pattern hacks etc. It is also worth mentioning that I found the dress is true to size when made up. Did I make any alterations to the pattern? No, however I may take in some of the fabric from the hips next time. The skirt piece is cut with a lovely shapely curve which is ideal for my shape, but just a fraction too much so I will taper this in on my next Bettine. The final step of the instructions calls for a 4cm hem. As the unfinished length of the dress was perfect for me, I decided to just turn up a teeny tiny hem on this occasion. Would I make it again? Definitely! 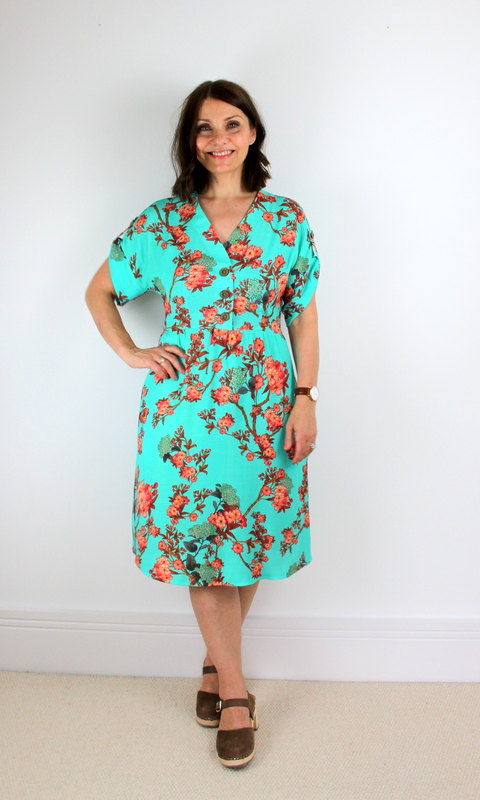 Two Bettine dresses are not enough! I may try it in a lovely jersey next time as I noticed on the Tilly website that there are some good tips and advice for making it up in jersey. It’s a super little ‘throw over the head’ dress, and a real winner in my eyes, so easy to see why this dress is so loved by so many! I would love to know if you have made a Bettine, let me know your thoughts I would love to hear from you!